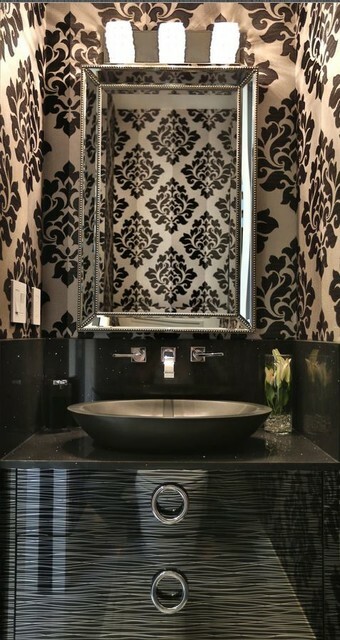 Glamour is the statement in this compact Powder Room with a floating vanity. An oval stone vessel sink sits on a Cambrian stone counter with extra high backsplash to match. Chrome faucets with Swarovski crystals add the finishing touch. Where can I purchase this vanity? This vanity was custom made for the client. It is a high gloss laminate material. Let us know if you want more details.....custom made allows you to create exactly what you want. This client loves high gloss, rich, elegant everything! We added the higher back and side splashes in a leathered black granite to accommodate the low vessel sink. The hardware selection can make or break the slab (flat) doors of the cabinetry. In this case, it is what gives the vanity its finishing touch! Dark tones and beautiful wall paper.